Titan Poker opened their doors in 2005 and today this poker site is considered to be one of the best overall poker sites thanks to their strong position in the world of online poker. Well known for their great customer service, this poker room has a great international player base and, generally speaking, very soft games at the micro and low stake levels. Note that Titan Poker has heavy European traffic but does not currently accept US players. Titan Poker may be relatively new on the online poker scene, but as part of the massive iPoker network, their traffic levels are top notch, with over 10,000 ring game players and 55,000 tournament players during peak hours. The number of logged in players is displayed on Titan Poker's main page, enabling you to always see traffic levels when you log in. The majority of players are European, and the peak hours reflect this. Their traffic continues to expand every day and, even as more experienced players flock to other poker variants, this will still increase as new and casual players stick to the Texas Hold'em tables. While Titan Poker does have a wide selection of very soft players at the low stakes tables, there is still plenty here to draw in the more experienced players. The key here is wise table selection. As more and more players come to Titan Poker the competition is getting a little more balanced but it is still not terribly difficult to find a table where players see the flop at least 50% of the time. They also have a great selection of satellite tournaments which help to draw in the top quality players who are interested in the million dollar European Championship of Online Poker and other live events that can offer seats in other big ticket events worldwide. Titan Poker's software is visually pleasing, with great graphics. All of the necessary information is well organized and easily filtered to make it simple to find the games that you most enjoy playing. 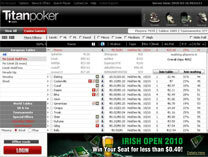 Running on the iPoker network means that Titan Poker's software is also consistently up to date, stable and secure. Titan Poker also offers a no-download Flash poker room option which is convenient for instant play on the go and for Mac users. The software supports 10 different languages that are also supported by the customer service staff. This makes Titan Poker a great choice for international poker players. Titan Poker's bonuses are quite large and impressive - the welcome bonus, for example is a 200% match bonus worth up to $2,000! However they do have restrictive rollover requirements that may make it difficult to completely cash in on a larger bonus before it expires. Make sure to read the fine print to see if you're going to have any difficulty with this. Luckily, there are new bonuses and promotions offered regularly that existing players can take advantage of. Titan Poker also has a revamped VIP program that makes it even faster for players to build points and earn rewards, with different levels that offer additional benefits and rewards to players that are more serious about their game, such as high rollers.With a good loyalty program, regular bonuses for new and old players alike, and a great referral system, Titan Poker makes it easy to keep a healthy bankroll! 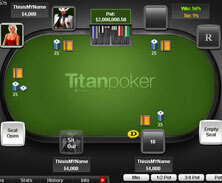 Titan Poker has won awards in 2006, 2007, 2008 and 2011 for their excellent customer service. They give you a number of different methods to contact them, including phone, fax, email, snail mail, and live chat. Their phone service offers a variety of numbers (including toll free), and their email support staff is quick to respond and knowledgeable. The ability to contact customer service without ever leaving the poker table is a huge plus.